There's a Quilting Store a few blocks away from us that we frequently visit. 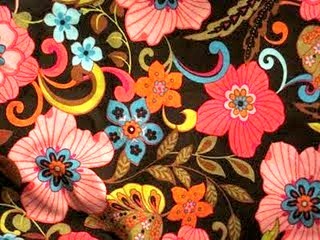 It's a guilty pleasure for us, as most of the fabrics there are priced at $15 a metre... In the real world, that's a good price- but a little out of my budget for most of our projects- but it's always fun to visit. A month or so ago, one of the workers dropped a hint of a sample sale that would be coming up. Basically, designers send the store sample books, and they are cut up into smaller swatches, and sold by the pound ($13/lb). We drove past the store on the Saturday sale morning, on the way to drop Hazel off at Grandma's house. It was an hour before store opening, and there was 2 people lined up already. When we arrived back 30 mins later, there was 15 or so people. Jackie began to warn me of how large groups of women can get crazy when there's a sale. I shrugged the warning off, and found it hard to believe that a group of women could be, well, un-ladylike. The lineup soon doubled behind me. And at 10 am, the doors opened, and a group of middle aged women, and Jackie, and myself (the lone vessel of testosterone) piled into the store. There was 4 tables stacked a foot or so high with stacks of fabric swatches. And they were on a mission! I withdrew from the crowd, and retrieved swatches when Jackie's hands were full. It was intense! At one point, Jackie encouraged me to get in on the action... and I tried to break into the swarm a bit, but kept getting butted out (literally). One of the many great finds of the day! 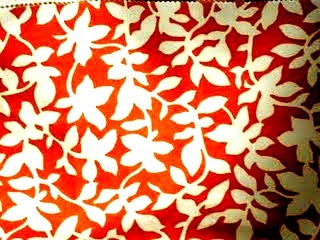 Finally, I noticed this coral and white print swimming past- and no one was going for it. I lunged, and retrieved the swatch, and the lady to my right elbowed me out of the crowd and shoved me back. I was apalled!! I tried shoving back a bit, but it didn't work out so well. We ended up scoring a whopping 2 lbs of fabric swatches (and came back a few more times this week for more) and got some pretty sweet pieces. We're planning on using some of the swatches to make Hazel a quilt for her bed, and may venture into making a patchwork slipcover for our nasty TULLSTA chair. 1) Most of the women there picked ugly samples. Next year, I might just wait a few hours to go until the madness has subsided- that way, all of the fun trendy pieces will be left behind and all the ugly cowboys and christmas tree prints will be gone. 2) I will never get in the way of a group of women and a sale again. Or, at least, I will reluctantly and will be emotionally prepared to do so. I learned something that day: There is an inner crazy person that is fueled by estrogen within every woman. And being around other women when excited by a sale, feeds off one another and internalizes into an ultimately-crazy-mob. All in all, it was good fun, and in all seriousness, I actually can't wait to go back again next year and do it again. P.S. Happy 100th post to me!